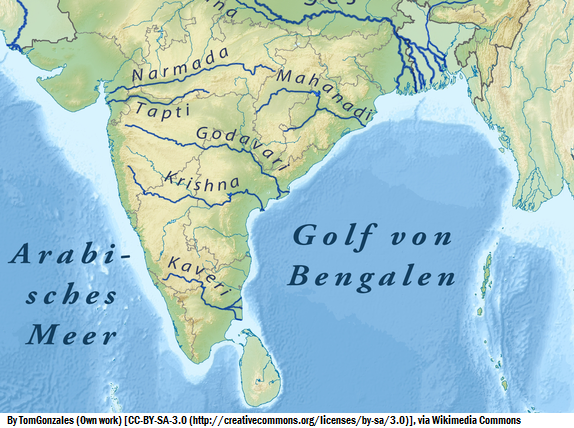 The rivers which covers the area of South India are Godavari, Narmada, Krishna, Mahanadi, Tapti, Sabarmati and there tributary and distributary rivers. It is second largest river of India. Jayakwadi Dam built on Godavari is one of the largest earthen dam of India. The word Narmada means "The giver of Pleasure". It is the longest west flowing river of india. It divides the India in southern and northern part. It flows from the east to west. It is believed that tapti is the daughter of Surya and Chhaya. Hirakund Dam build on Mahanadi is one of the longest earthen dam of Asia. The delta build by the rivers Mahanadi and Brahmani is one of the largest of India. It is the third longest river of India. The famous Shivanasamudra Fall is formed on this river. Asia's first hydroelectric plant was built here. Grand Anicut dam is build on Kaveri river. The famous Sabarmati Ashram was build on the banks of this river.